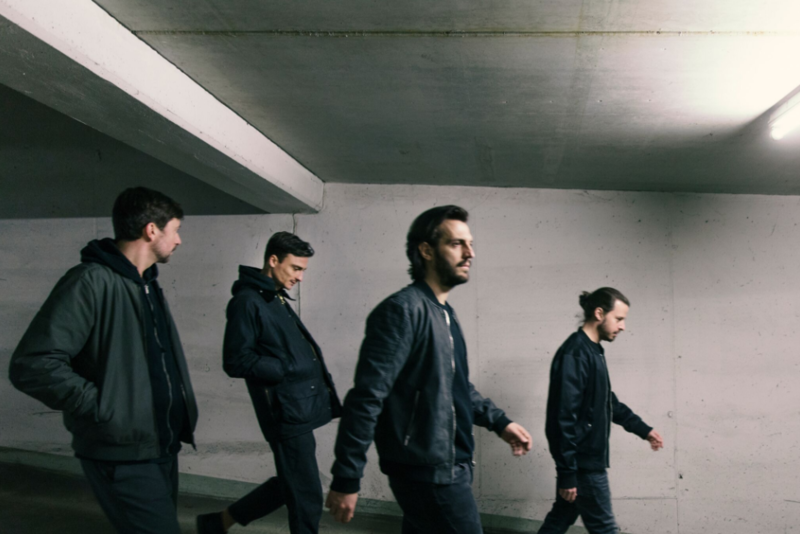 With regular appearances at Berlin's highly lauded Watergate Club, four-piece live act GHEIST are familiar faces in the decorated electronic music city. Now they're launching their own label, Radau. So we caught up with the group to talk about their roots, studio process, and their latest single, the breezy, party friendly tune "Ueberall," which is out on 28th September. You can pre-order it on Beatport. Great to have you guys here for an interview today. Can we start by talking about how you all first met and what really sparked the idea to form a band and expand into electronic music? The pleasure is on our side! We met round about 12 years ago when we were studying music. Since we’ve been working together in various constellations from the beginning on it was a logical consequence to start GHEIST at some point. The spark that made it all happen for us is friendship, respect and trust that we have for each other. On top of that we share a great love for electronic music. So there was no doubt that we had to form a group and tour together. What was the thinking and main philosophy behind the RADAU imprint? Your "Frequent Tendencies" was the debut track and has certainly made a lasting impression. We always had the idea to found our own label and we had the feeling it was about time to do it. To us Radau means freedom. The label gives us the opportunity to release our music whenever we want to. On top of that it’s a space to develop our idea about music, it’s vibe and the way we approach the music industry itself. It’s all in our hands and we have full power over every step we are taking. To do everything by yourself comes with a great responsibility but it’s also very satisfying and maybe at some point in the future we can give other upcoming artists an imprint to share their passion for music with all of you. We think that’s actually pretty cool. "Ueberall" is the second release and is out on 28th September. What was the process between you like for creating this track? "Überall“ contains all the impressions we were allowed to make throughout the last few months playing all these shows. We’ve been through such great, funny and crazy moments that had a huge impact on this song and it’s definitely the kind of sound we as GHEIST and Radau stand for. It’s a very important release to us and we couldn’t be more happy and excited about it. When coming up with track ideas, do you usually all focus on certain elements or is it different every time? Of course each one of us has a certain key strength to bring to the table but still we are quite open to change our routine when it comes to a creative process. In general we think there are no rules. On the other hand we definitely have worked out a pattern that we can rely on throughout a creative process. Most important to us is a good flow to maintain a good vibe. You’ve played at Watergate several times—it’s certainly one of Berlin’s most prestigious clubs. What, in your opinion, makes it so great compared to others? First of all we are really grateful for the support we’ve been receiving from the beginning on. What makes Watergate such a great club to us, besides the fact that it’s very well organized and the great location itself, it’s the people that work there. They always treated us in such a nice way it was inevitable that we became very good friends. Watergate is to us a home base within the Berlin club scene. What’s the best thing about being a touring band/group? There is no doubt life is better if you share it. We are like family to each other, so to travel the world together with our very own music is certainly the greatest gift we could get. It’s a dream come true and we for sure don’t want to travel hangover by ourselves. If you were not producing music, what would you guys be doing right now? That’s a question we’ve been trying to avoid for the last 15 years cause we don’t have a clue. To us music is the only reasonable perspective we have and we hope it will stay like this for the rest of our lives. We truly love what we are doing and we are most thankful that we are able to keep on sharing our output with each and every one of you. What music have you been listening to lately, and who inspires you most within the industry? Guess it’s hard to say who inspired us the most, it’s always been a mixture of newer and older stuff, and electronic and not electronic music. We really liked Ross from Friends' new record Family Portrait, listened to it quite often. Portico Quartet's latest album is simply beautiful. Last but not least, Four Tet never ceases to amaze us! Next month you’ll be appearing at the Berlin: Watergate x Club Feierei showcase for ADE. What are your expectations for this night, the performance and the week in general? GHEIST is attending now for the third time at ADE and we have to say we love Amsterdam. It’s such a nice city with such a great vibe and on top of that the whole event is very well organized and packed with great artists. We just recently played a show in Amsterdam with an amazing audience and we are sure it’s going to be great again. We are expecting to meet lots of good friends from all over the world, have way too many drinks and way too little sleep, so it’s going to be fantastic. Our final question to wrap up this interview—what makes dance music so special to you? Dance music is a very free genre. There is no right or wrong, it’s all about creating a certain vibe, atmosphere and sound so your audience can get lost in it. To share this specific moment packed with energy, with your friends or simply the people around you, on stage or the dancefloor is so fulfilling and special that it’s hard to describe. It’s been for us, and it still is, a life changing experience.